Labeled “The Seven Dwarves of Menopause,” they grinned out at the audience from the projector screen in Helen Wood Hall Auditorium: Itchy, Bitchy, Sweaty, Sleepy, Bloated, Forgetful, and Psycho. 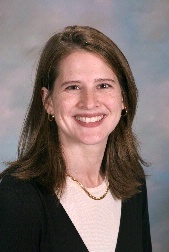 “So, I’m interested in numbers 2, 6, 7, and a little bit of 4,” quipped Miriam Weber, Ph.D., assistant professor of neurology and obstetrics and gynecology, at URMC. For the past decade, Weber has been studying cognition in women in the menopausal transition. While the symptoms embodied by the Seven Dwarves have long been accepted as common experiences for women in the menopausal transition, there hasn’t been a particularly robust array of science to support the cognitive symptoms until recently. On Sept. 23 at the CTSI Seminar Series, Weber shared her past work in the field and discussed how her current study is expanding on her previous findings. In creating her original study, Weber had a little background from two prior studies. The first, published in 2000 (SWMHS-Mitchell), found that 62 percent of middle-aged women reported an undesirable change in memory. Meanwhile, the longitudinal SWAN study had also found that 40 percent of peri- and post-menopausal women listed “forgetfulness” among a self-reported inventory of their symptoms. With this data as a backdrop, Weber launched her Rochester Investigation of Cognition Across Menopause (RICAM) study, hoping to expand on the findings. The first study took place in 2005-2006, and a second took place from 2007-2009. Weber is now in the midst of her most comprehensive study yet, which began in 2010 and runs through 2015. “Memory complaints really do reflect objective performance, maybe not in retentive memory, but in working memory,” said Weber. Since publishing her initial results, other groups have reported similar findings — other researchers found that memory complaints were associated with loss of verbal memory and attention, that subjectively recorded memory problems were associated with objective measures, and that the brains of post-menopausal women with cognitive complaints were working harder in order to perform to previous levels. “These are high-functioning women, and they’re not impaired, but they’re noticing subtle differences,” said Weber. Weber’s study also looked which women were struggling the most with memory symptoms, and found that women in early post-menopause — the first year after the post-menstrual period — were performing worse with verbal learning, verbal memory, and fine motor and dexterity, than women in the late-reproductive stage. In confirming that women are indeed good at self-reporting their memory symptoms during the menopausal transition, Weber offered a few directions for future studies. Among other suggestions, Weber said that researchers need better measures of symptoms known to impact cognition. She’s also hoping to expand the study to multiple sites and make it more representative, which may allow for more parsing of the data. The new SRB Data Blitz! Series aims to give a broad and entertaining overview of research programs in the Saunders Research Building. 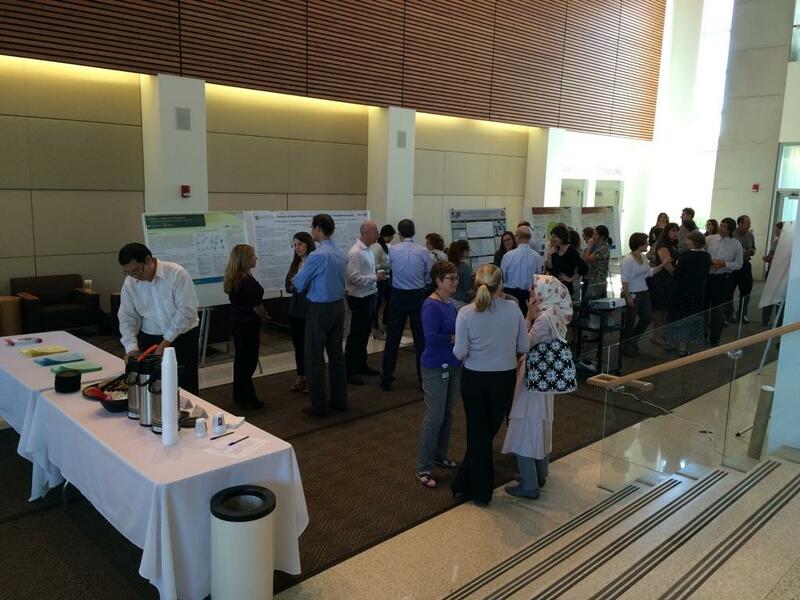 The inaugural session was held on September 24th, 2014 in the Saunders Research Building and featur ed both poster and live presentations from members of the Heart Research Follow-up Program. Dr. Wojciech Zareba, Director of the Heart Research Follow-up program, welcomed approximately 40 attendees and offered opening remarks for the event. 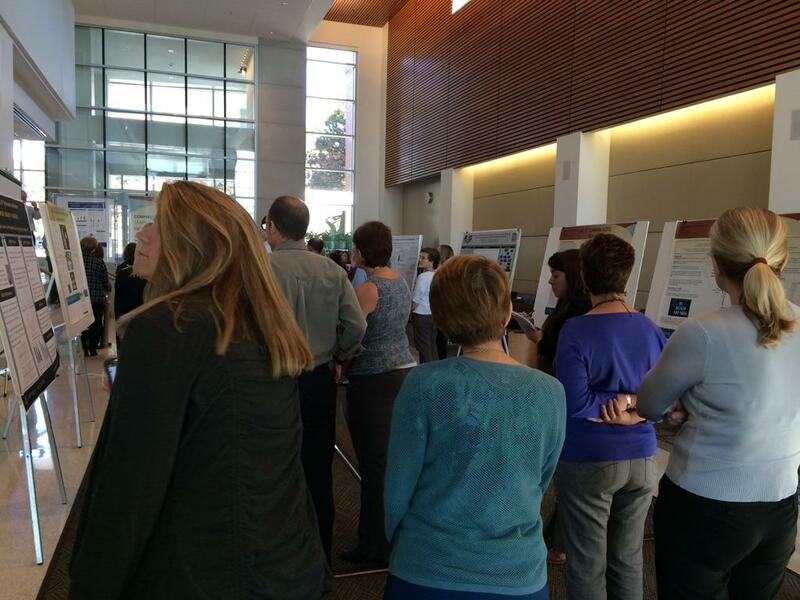 Eight posters were setup for attendees to peruse as their own leisure and a slide presentation ran throughout the event, highlighting recent research projects and findings. PDFs of the posters and the presentations are available on the CTSI Website. Additionally, there was a Long QT measurement station where attendees could have their levels assessed in 30 seconds. This technology aids Doctors in identifying patients at risk for heart disease and prescription side effects. Make sure to join us for the next session of the SRB Data Blitz! Series which will be held on October 29th and will feature research from the Developmental Disabilities group. See you then! Welcome to our new quarterly feature: Checking in at the CRC! Every few months, we’ll chat with Ann Miller, nurse manager at the Clinical Research Center, to learn more about all the ways that the CRC supports researchers and their human subjects. In this kickoff edition, Miller gives an overview of the center. Whether it’s coming from Upstate New York or Antarctica, Margaret Demment can help you make sense of that data. Previously a postdoctoral associate at Cornell University, Demment is one of the newest additions to the rapidly-growing CTSI Biomedical Informatics team, and she’s already begun work on a variety of projects. Alongside Tim Dye, Ph.D., the director of the CTSI’s Biomedical Informatics team, she’s currently helping to create and study a massive data set called the Perinatal Data Network. The data, collected from more than 1 million women in Rochester, Syracuse, Albany, and Buffalo over the past decade, gives a snapshot of the women’s health just after giving birth. Demment and Dye would eventually like to make this data set accessible to researchers, but for now, Demment is studying the implications of an unwanted pregnancy on the health outcomes for the mother and child. Unwanted pregnancies are relatively rare, but the large dataset is allows her to perform the analysis previously impossible in other datasets. 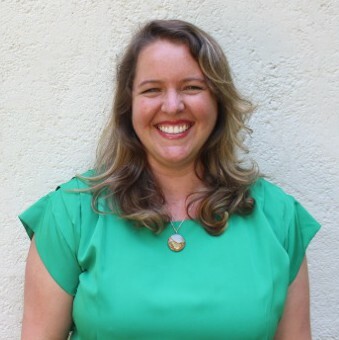 A second project she’s involved in involves a qualitative analysis of a series of interviews conducted with researchers and workers in Antarctica. That Demment is capable of working on such wildly different projects is among the reasons that she joined the CTSI Biomedical Informatics team. Demment is currently working at the university part time. She’s also still finishing up some work at Cornell, while maintaining a side business that performs data analysis and program evaluation for community health organizations in Rochester. Her office is within the CTSI Director’s Suite; stop by and say hello. When it comes to autoimmune diseases — conditions such as lupus, rheumatoid arthritis, and multiple sclerosis that cause a body to attack itself — women are at a higher risk than men. But the reasons why aren’t completely clear. Antinuclear antibodies (ANAs) are present in patients with autoimmune conditions, but the vast majority of ANAs haven’t been tied to certain diseases. Without good biomarkers to use when testing patients, diagnosis can be challenging, and prevention becomes nearly impossible. So researchers at URMC are working to understand more. 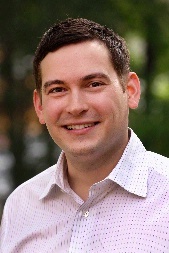 On Sept. 9, at the CTSI Seminar Series, Todd Jusko, Ph.D., assistant professor in the Department of Public Health Sciences and Department of Environmental Medicine, shared his past work and his search for an easy-to-identify biomarker. Jusko was part of a group that looked at ANA prevalence in 4,340 individuals from the National Health and Nutrition Examination Survey, or NHANES between 1999 and 2003. Among those participants — 14 percent tested positive for ANAs in their blood. The proportion was slightly higher for African Americans, and, interestingly, slightly lower for individuals who were obese or overweight. Women were also much more likely than men to test positive for ANA prevalence, particularly in their reproductive years, or just beyond. Overall, 18 percent of women tested positive for ANA, while 10 percent of men did. Women aged 30-39 were 2.5 times as likely to have ANAs in their blood as men. Women aged 40-49 were four times as likely. Nulliparous women — women who have not carried a pregnancy past 20 weeks — were also found to be much less likely to have ANAs present in their blood. “Certainly, it’s related to some sort of hormonal difference,” said Jusko. For a more recent study with the NHANES database, Jusko began searching for environmental causes of ANA. Dioxins and dioxin-like compounds have been documented to alter immune function, so it seemed logical that their presence may play a role in ANAs. Jusko did find that one compound, triclosan, was biologically plausible as a potential cause of ANAs in men only, but his research revealed a variety of limitations with the data available. Jusko stressed the need for further studies measuring incident, or newly arising ANA and linking it to environmental chemicals. Sometimes, as Albert Einstein once famously opined, scientific breakthroughs come from looking at an old problem from a new angle. Now, Eliseev thinks that techniques being applied to aging patients with cardiovascular disease might also apply to aging patients with osteoporosis. 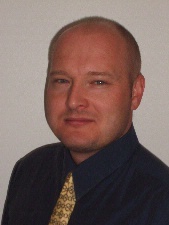 His research, supported by a 1-year Pilot Grant from the CTSI, began on July 1. For several years, researchers have been studying mesenchymal stem cells that can transform into other cells, such as bone, cartilage, muscle or fat, when necessary. These cells are also responsible for bone repair. But if the energy-producing mitochondria within those cells lose their effectiveness, then the cell won’t have the energy to differentiate into the various cells the body needs. This energy loss often occurs in aging patients, putting them at higher risk for various degenerative diseases. Eliseev has seen this disruption occur in the bones of aging mice and believes that the same disruption likely occurs in humans. 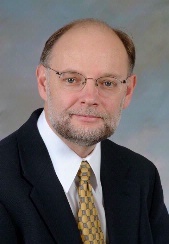 Eddie Schwarz, Ph.D., who was on the committee that selected Eliseev’s project from a variety of Pilot proposals, said that the project’s originality — and the fact that Eliseev is one of the only researchers studying the topic — were among the reasons that it was chosen for a CTSI Pilot Grant. With data generated from the Pilot study, Eliseev is hoping to seek an R01 grant to further illustrate the role of the mitochondria in mesenchymal stem cells, and run a small clinical trial in humans. Eliseev’s findings may be quickly translatable to human care, as several drugs that protect mitochondrial function are already in clinical trials and could be repurposed for the necessary treatments. Bone marrow biopsies could also be used to extract mesenchymal stem cells from a patient, which could then be manipulated them to enhance mitochondrial function, and reinserted into the patient to accelerate fracture healing.